It’s been a while since I’ve written… having been immersed in this glorious summer… and the every day business of life… but then my thoughts began exploding, and I was drawn – back again -to write. I have to laugh though… because my mind’s constantly popping with new ideas, projects & ever so many things I want to do & try… and I swear, there’s just not enough time in the day to do everything I want! I’ve begun compiling ideas for a new cd, which leads me to thinking even more. But I know I need to move past a few apprehensions… and reservations I’ve been holding, as they’ve become tedious. So time to sweep those out of the corners and be rid of them. 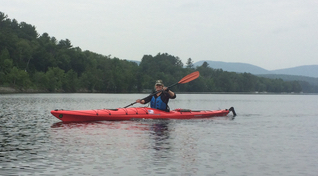 In that area… of moving past fears, I think kayaking served as a huge turning point for me. Since childhood, I’ve been afraid of dark waters… but I really wanted to kayak… so I forced myself to overcome the fears, and happily so! BIG lesson – learned. So… within the last few weeks… I thought I saw an old ghost from the past, come into the Pub when I was performing one night with the band. Not a really welcome ghost… just someone I don’t care to reconnect with… I began thinking, what would I say? What would I do? How would I handle that situation? Thankfully, I was mistaken, but the likeness of this stranger -was so similar – that even Philip thought he recognized the old ghost. Then… I also had an interesting, intelligent, talented musician cross my path. My gut reaction made me want to hold back… listening to the ‘what if, what if, what if’ – echoing in my head. I do listen to my inner voice & trust my intuition… but this time… I don’t think it was intuition… I think it was fear. So I’ve thrown the “what ifs’ – into the wind… and know this will certainly be an interesting adventure… and I’m trusting he was put in my path for a very good reason. Each day – I joyfully look forward to embracing creativity as it flows over me in warm waves of enlightenment & inspiration. One of my greatest joys is teaching fiddle… & witnessing that instant – something musical -sparkles- into someones awareness. I love playing music with friends; and expressing myself through various mediums of art… splashing colors and shades, and creating what ever I wish; gardening the flowers, fragrant herbs & veggies that grow and ripen…. 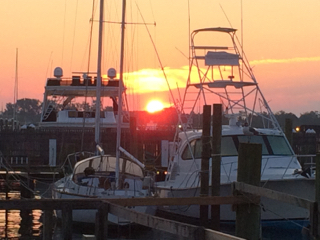 still warm from the sun – as it touches my lips. 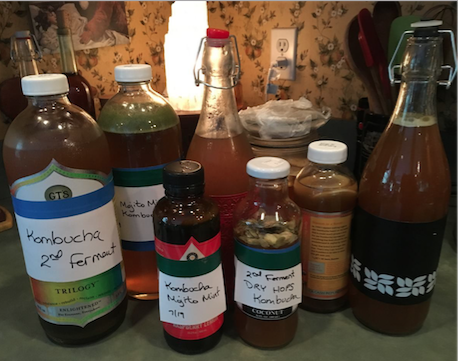 And this summer, I taught myself how to make kombucha… and then tried my hand at the second fermenting of it. I revel in it’s healthful, wholesome deliciousness… (Mojito Mint -is my favorite – but whew… Kombucha is a WHOLE other topic… so I’m not gonna get side tracked onto that!) But we even named our new, foundling kitten “Kombucha” -or- “Bucha” for short… haha). 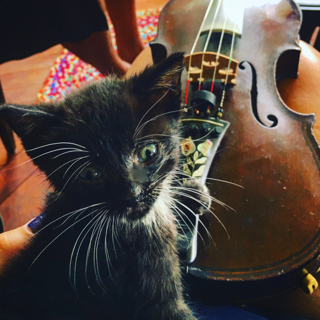 ‘Boucha’ loves the music too, having no problem sleeping on my lap when I fiddle! 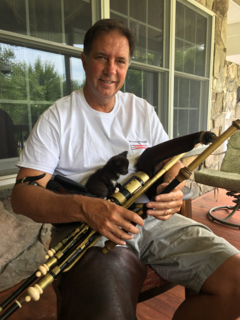 And looking at the joyful parts of life each day, there’s not a day that goes by, when I don’t realize that I’m more than blessed with my husband Philip… & we play wonderful music together. He is endlessly patient & kind with me, and lovingly encourages me to explore all the avenues of intellectual, creative, spiritual and emotional paths that I can find… as I ramble around in my searches towards personal development. I’ve never had one of those lives – like some… who seem to be walking on rose petal covered paths, and their life is perfect. (yet, to read my blatherings above, you’d THINK I have! )… but instead, I have a gift 0f viewing -the beautiful things in life… and overlooking the not so beautiful. I guess you could say – I feed the good wolf within…. and pass over the bad wolf. I strive to be free of old burdens… and to be able to fly… but I realized… it’s mighty hard to get off the ground when you’re loaded down with old ‘baggage’. 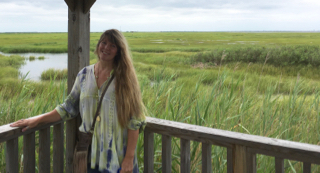 So, I made the conscious choice – to let it go… & give up the ‘stuff’ that held me back…. ousting the internal junk, even from my recall… and vanquishing the repeating, internal dialogs that would sometimes run in loop form – inside my head… causing me to have self doubt. Sure, all that is still part of me, & it’s shaped who I am… but it doesn’t have to control me any longer. So I weeded out the ugly – and held onto the good things that hold positive meanings. I can say now, that I KNOW – without a shadow of hesitation or doubt – that I’m on the right path… because I have absolutely NO interest, or even remote desire – to EVER look back again. And, thank you God… it feels wonderful. It’s sad… I know people who are looping & wallowing within their own baggage & issues… repeating them, blaming others, leaning on them, feeding on the bitterness within it all… and it’s sad, and really unhealthy. Get free.. let it go. It’s so much more fulfilling to embrace joy, love, & gratitude, as there’s so many joys that surround you, if you look ahead. Don’t hold onto the dark, bitter, & angry things inside from before… let it go & just enjoy the day, breathe deep, live… and fly free. Share the post "Fly away… without the baggage…"
Well done my lady..you’re words are music to my ears!! I LOVE You!!! Lovely sentiments woven into an interesting read!